IPL 2019: Playing his first IPL game, 22-year-old Alzarri Joseph wreaked havoc in Hyderabad as MI thump SRH by 40 runs to register their third win of the season. 22.53 IST: FOUR! Short and wide and it has been put away! A much-needed boundary for the hosts. It is short and outside off. Hooda cuts it through point and it races away. 22.23 IST: FOUR! Great shot! A short delivery on off, Shankar rocks back and cuts it through the cover region for the boundary. 21.33 IST: SIX! A one-handed biggie! Such is the power of this man, 100 up for the men in blue. It is the slower one and outside off. Pollard seems to have been foxed by it. He is a touch early into the shot and hence once hand comes off. He though still gets good enough connection and it sails over the long on fence. Once again perfect start to the over. Need a few more. 21.27 IST: FOUR! What a way to get off the mark and what a shot. Very clever! It is bowled outside off. Chahar waits for it and then plays it late past the slip fielder. Uses the pace of the bowler nicely and it races to the fence. 20.53 IST: FOUR! Lucky! Kishan goes on the back foot to this flighted ball and plays an educational edge which goes past the diving Warner at first slip and into the third man fence. 20.33 IST: FOUR! A gift there for de Kock. It is down the leg side and it is the quicker one. Quinton says thank you very much and then helps it on its way through backward square leg for a boundary. 20.26 IST: Have Hyderabad got another? Yadav has been given out LBW. He has reviewed. Impact may just save him here. 20.23 IST: FOUR! Welcome back into the attack, Sandeep. A terrific shot from Suryakumar. The back foot punch straight down the ground. Not easy to play those. It is shortish and around off, Yadav stands tall and powerfully punches it past mid off. It races away. 20.04 IST: DROPPED! Kaul has put down a sitter! How costly will this prove? It would have been a huge wicket. Rush of blood there as Rohit dances down the track and heaves it across the line. He only manages a top edge which goes high up in the air towards third man. Kaul seems to have judged it well but is falling onto the ground while taking it. In the end he spills it. He straightaway indicates that he lost it in the lights. The batsmen run one in the meantime. Could have been a wicket maiden this. Nevertheless, a very good first over by Kumar. 20.02 IST: A review early on! A huge shout for an LBW has been turned down. Hyderabad have reviewed. Rohit is the man in question. There seems to be an inside edge. 19.48 IST: Mumbai (Playing XI) – Quinton de Kock (wk), Rohit Sharma (C), Suryakumar Yadav, Ishan Kishan, Hardik Pandya, Kieron Pollard, Krunal Pandya, Jason Behrendorff, Rahul Chahar, Alzarri Joseph (debut), Jasprit Bumrah. 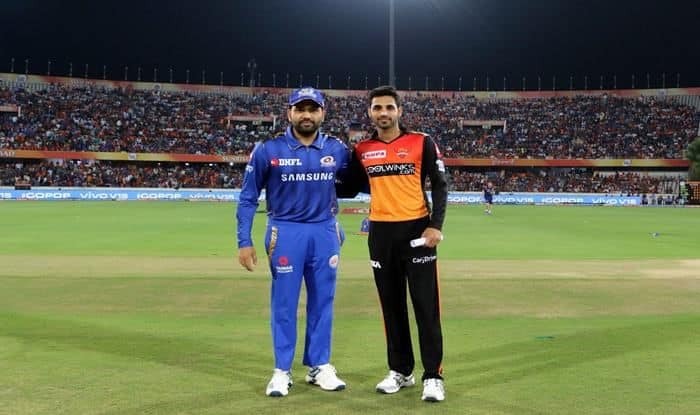 Hyderabad (Playing XI) – David Warner, Jonny Bairstow (wk), Vijay Shankar, Manish Pandey, Deepak Hooda, Yusuf Pathan, Mohammad Nabi, Rashid Khan, Bhuvneshwar Kumar (C), Sandeep Sharma, Siddarth Kaul. 19.41 IST: Mumbai skipper, Rohit Sharma, says he wanted to bat first. States they wanted to try a different strategy. Mentions they have a few plans against the opposition and they now have to execute it. Admits the last game was a great win. Further adds they have a very good bowling attack and they back their bowlers to defend any total. Informs there are two changes as Lasith Malinga goes out for Alzarri Joseph and Yuvraj Singh is replaced by Ishan Kishan. 19.35 IST: Bhuvneshwar Kumar says, “We are going to bowl first. Williamson is close to 100% fitness, but we aren’t even half way through the tournament and with the World Cup coming up he doesn’t want to take any chance. We are playing with the same XI”. 19.30 IST: TOSS – Bhuvneshwar Kumar calls it right at the toss as Sunrisers Hyderabad opt to field vs Mumbai Indians. 19.00 IST: Hello and a very warm welcome to our live cricket blog of match 19 between Sunrisers Hyderabad and Mumbai Indians from Rajiv Gandhi International Stadium, Hyderabad. Brief Preview: Jonny Bairstow will be keen to continue his run riot and keep the Sunrisers Hyderabad juggernaut rolling against a Mumbai Indians side that is getting into the groove after an up-and-down start, in their IPL match on Saturday. Currently holding the top spot in the points table with three back-to-back victories, the confident Sunrisers would not like to spare an inch against Mumbai, lying at sixth place, with two wins and as many losses from four outings. However, Mumbai will take heart from the fact that they defeated defending champions Chennai Super Kings, their first loss in four games, in the last match. In contrast, the Sunrisers, after losing their opening game against Kolkata Knight Riders, went on the win against Rajasthan Royals, Royal Challengers Bangalore and Delhi Capitals. The Sunrisers, in fact, were without the services of their captain Kane Williamson during Thursday’s match against Delhi because of an injury, but they did not let that have an impact. Bhuvneshwar Kumar led from the front as the seamer, along with Mohammad Nabi and Siddarth Kaul, chipped in with two wickets each to restrict Delhi to 129 for eight. And with opener Bairstow (48) once again shining with the bat, the Sunrisers had a cakewalk, cruising to a five-wicket win. Come Saturday, the Sunrisers would again be banking on the English batsmen to deliver the goods, besides Australian David Warner. The marauding pair of Warner and Bairstow have been in scintillating form this season, having shared three century-plus opening stands in four matches.